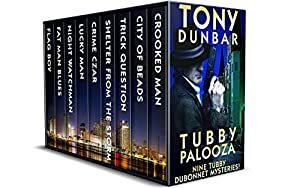 A simple man with a refined palate, maverick New Orleans lawyer Tubby Dubonnet has a penchant for fishing, Old Fashioneds, off-track betting, and fighting evil while passing a good time. Passing a good time, of course, includes running from the mob, solving gritty crime lab murder mysteries, thwarting hurricane season bank heists, and a good deal of rubbing elbows with corrupt politicians -- all this while answering to a family of beloved women that he just can't seem to slip anything past... And with each action-packed adventure, you can trust -- because this is a Tubby Dubonnet mystery -- that these disparate events are intricately intertwined. A veritable best-of, this murder mystery anthology includes nine of Tubby Dubonnet's Anthony and Edgar-nominated hard-boiled legal thrillers. Meet lawyer Tubby Dubonnet. His clients are all renegades from the asylum (aka Orleans Parish), including Darryl Alvarez, the manager of a local nightclub who's been caught unloading marijuana from a shrimp boat. At their first meeting, Darryl entrusts Tubby with an ordinary-looking blue gym... of money. What could possibly go wrong? Tubby Dubonnet is bored. Sure, researching licensing law for the new casino will keep trout meunière on the table, but what could be more tedious? (Unless, of course, the client's dealings are steeped in conspiracy). Medical lab janitor Cletus Busters is caught red-handed in a restricted area with the frozen head of Dr. Whitney Valentine. Busters won't say much, except that he's innocent. Calling Tubby Dubonnet! To out-of-town kingpin Willie LaRue, Mardi Gras seems the perfect time for a New Orleans heist. Parties, parades, chaos, alcohol - who could be concerned about a little thing like a bank job? Indeed, all might have gone well except for an out-of-season frog-flogger that threatens to flood the French Quarter. Tubby can't forget the last words that escaped an old friend's lips, and he can't get out of the way of a political campaign that's turning rough. Obsessed with the idea that a shadowy crime boss may be pulling the strings that have cost good people their lives, Tubby is entering into a test of courage with the most violent men in New Orleans. It's a city of sin. And murder is only one of them. So what if Judge Hughes shared a few special moments with Sultana Patel -- why is this a matter of public interest? Until the D.A. hatches a plot to ensnare them -- and their lawyer Tubby. And what a web they're ensnared in! When in the 1970s a young war protester is killed in broad daylight on Canal Street, it appears that his murder will be forgotten. But a youthful Tubby chanced to see it happen, and the tragic event's haunted him throughout his life. Decades later, Tubby decides to conduct his own investigation. And stirs up a hornets' nest. Ex-con Angelo Spooner is trying to start a legit business, but he just can't catch a break. Just as his healing Holy Water, "Angelo's Elixir" is about to go upscale, the sticky strands of the Big Sleazy's tangled web of crime and corruption come running. What's a law-abiding parolee to do? Hire Tubby Dubonnet, of course! The set-up alone's enough to make you believe in the butterfly effect. Two acrobats burglarize a house; a sultan moves into a French Quarter mansion; a Mardi Gras Indian, in the wrong place at the wrong time, is wrongfully arrested; and our hero Tubby Dubonnet comes upon a double murder while paying a social call on the bayou. Log In to track Tony Dunbar on eReaderIQ. to be notified each time the price drops on any book by Tony Dunbar. to stop tracking Tony Dunbar. We started tracking this book on November 23, 2018. The price of this book has changed 4 times in the past 152 days. The highest price to date was $9.99 last reached on March 30, 2019.